What is it like to work in some of the most beautiful natural areas in North Carolina? What are the perks of being able to call the great outdoors your office, and what are the responsibilities and duties that come with it? At our January 18, 2013 Open Minds Café in Whiteville, NC, a park ranger from three Lake Waccamaw State Parks answered these types of questions and introduced the teens to some of the science being done every day in the park. 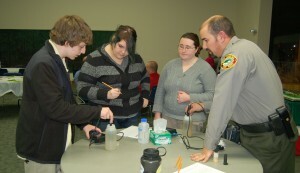 Teens in Whiteville, NC test water quality with a local park ranger. Photo by Kellie Lewis. Lake Waccamaw State Park protects a section of the unique Carolina Bay ecosystem, which is of interest to geologists and ecologists and whose formation remains a mystery to scientists. Each ranger presented on a different aspect of the park and their duties, introducing the teens to a potential career opportunity and to a resource for connecting with nature less than an hour away from their homes. The teens were particularly interested to learn about the outbreak of the invasive water plant Hydrilla in the lake, as the rangers told them how they had been tracking its spread and were working with state Department of the Environment and Natural Resources scientists on a plan to curtail it, and expressed interest in helping with the efforts to stop this invasive plant themselves. The highlight of this presentation was by far the many interactive activities the rangers brought with them. The rangers brought many different pieces of equipment that they use on the job and split it up into three stations. After the talk, we split the teens into three groups and had them rotate through the stations to meet with each ranger. At the station about law enforcement and controlled burns, the teens were able to try on the various parts of a park ranger’s uniform and learn about the importance of fire to the Lake Waccamaw ecosystem. The rangers brought their equipment for testing water quality, so at that station, the teens were able to test and record data on measurements like dissolved oxygen and pH of different water samples. The third station had a section of a tree trunk, and the teens learned about determining the age of a tree based on its rings and the various assessments the rangers can do on trees in the park. After the teens explored the stations, they sat back down in three different groups at their tables and played a modified version of Jenga that helped them understand the interconnectedness of an ecosystem and how one seemingly small change can bring the whole thing down. Note: These resources are intended to inspire others presenting a Teen Science Café. Please contact the creators of the resources if you have any questions about their appropriate uses.